The Fall Seminar is a daylong event held each Fall in late October or early November in the Portland Metro area. 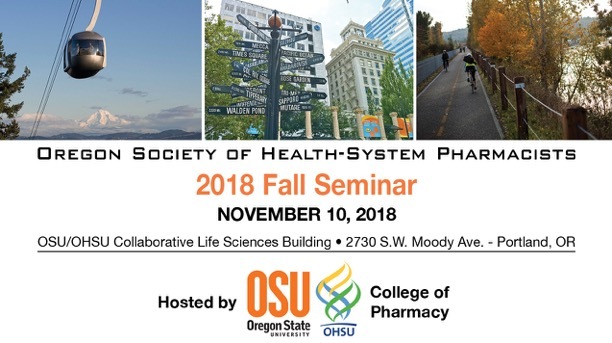 Fall Seminar delivers about 8 hours of continuing education for pharmacists and technicians. A variety of clinical education programs are offered that appeal to pharmacists and technicians practicing in ambulatory and hospital settings. A student-specific track provides information about ASHP Residencies and career opportunities for new graduates. Students can obtain specific information about residency programs in Oregon and SW Washington at the Residency Showcase. Throughout the day, it is possible for attendees to visit with pharmaceutical industry partners at an array of exhibits. Please contact the Education Affairs Council chairs if you would like to assist in organizing this fantastic event! Interesting in Exhibiting? Click HERE for Details!